Experience an entirely new and fun side of nationally known composer Soon Hee Newbold. 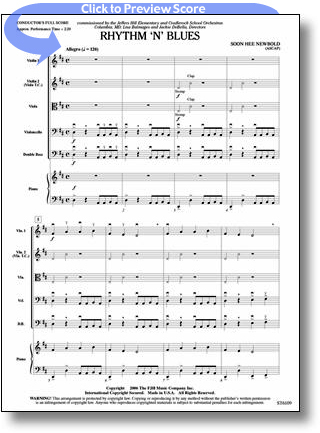 Opening with a catchy melody and a blues line in the cellos and basses, this piece is perfect as a lighter selection on your next concert. Soon Hee even creates a fabulous stereo effect with the entire orchestra stomping, clapping, and snapping their fingers. Sure to be a hit!